In 1960, three years after the publication of "On the Road", which made him a celebrity, Jack Kerouac was finding his fame wearying. He was pushing forty, and harassed by beatnik groupies who thought he had the answers to Life. He was a severe alcoholic. Fearful that he was losing his grip on his art, he went to stay in poet pal Lawrence Ferlinghetti's Big Sur cabin for a back-to-nature writing retreat. It didn't quite work out as planned, and the book that resulted, titled "Big Sur", is an excruciating howl of pain exacerbated by delirium tremens and restless anxiety that sometimes tipped into insanity. Written in Kerouac's typically honest stream-of-consciousness style, and owing much to James Joyce, "Big Sur" exists entirely inside the mind of a man going mad. Michael Polish's "Big Sur", starring Jean-Marc Barr of "Dogville" as Kerouac is a strangely tepid experience for such searing psychological material. The fault lies in the heavy reliance on voiceover (all taken from the book), which distances us from what is happening onscreen. Scenes are not allowed to unfold, to explode, to develop, to sit there, because the voiceover is too insistent, interjecting itself every other moment. What would have happened if the voiceover had been used more sparingly? What f the beautiful collage effect of Kerouac's time in the woods (the film is stunningly beautiful) had been allowed to develop on its own, leaving more room for interpretation, chaos, life? There are moments that are allowed to breathe, but they are few and far between. The acting is all excellent, once you push past the voiceover that stands between you and the performances. Josh Lucas plays Neal Cassady (a brilliant casting choice). Anthony Edwards is excellent as Ferlinghetti, openly concerned about Kerouac's lifestyle and drinking, but fearful of being a nag about it. Kate Bosworth plays Billie, Neal's mistress, who is then passed off to Kerouac. There's a quiet moment (un-interrupted by voiceover) during a party at the Big Sur cabin when Cassady lays his head down on Kerouac's shoulder, an intimate and cuddly gesture. In the book, Kerouac writes of Cassady that he "carries that strange apocalyptic burst of gold he somehow always manages to produce." Just by showing up, Josh Lucas embodies that magic, in both its elusive quality and its light-hearted sense that all things may still be possible, even after all of the disappointments. The shots of Big Sur (M. David Mullen is the gifted cinematographer) woven throughout the film—the billowing fog, the towering redwoods, the long line of crashing waves, the cloudy sky out to sea—are magnificent as well as alienating. The visuals evoke a beauty so grand that we can never hope to enter into it. It is a beauty that is closed to Kerouac, a fact that he finds distressing. We see Kerouac sitting by the waves staring out to sea. We see him wading by the creek, we see him typing. He reads "Dr. Jekyll & Mr. Hyde" by the fire, and, of course, over the course of the film his own split personality will crack open, revealing the abyss within. It is clear that there will be no coming back from Big Sur. Something died during his short time out there. He had less than 10 years left to live. 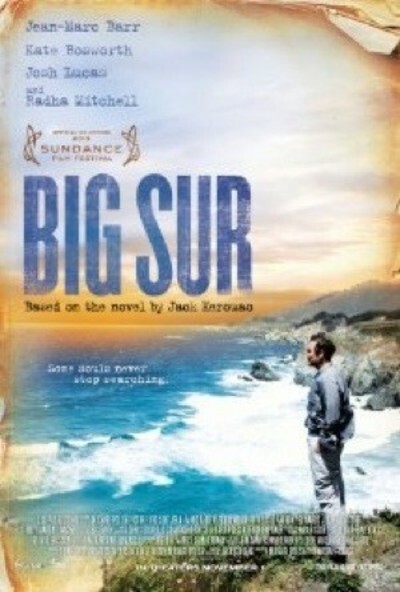 Watching "Big Sur", you are amazed Kerouac lasted even that long. The film is quite strong in its unblinking portrayal of alcoholism, depression, and mania, but it would have been stronger without a voice telling me over and over and over again how I was supposed to be feeling about it.